We all know Pickle Baby is the perfect pickle, that doesn’t mean there can’t be other perfect pickles out there. 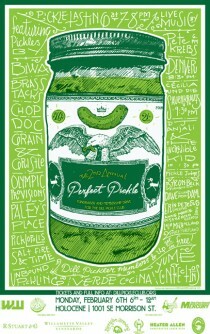 Have a rare chance to discover your perfect pickle while while supporting the Dill Pickle Club. You can even get your picture with Pickle Baby! Please join Pickle Baby Monday, February 6th for the 2nd Annual Perfect Pickle event. 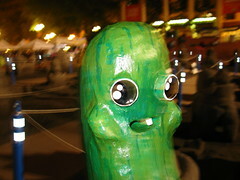 The picklecentric event is a fundraiser and membership drive for the Dill Pickle Club. Try tasting a wide variety of pickles from some of Portlands pickliest picklers. In addition to the picklers there will be a number of amazing musicians and artists there. Plus if you are lucky you will get a chance to get your picture with the Pickle babies too! Get your tickets here! or rsvp on Facebook! Next Next post: Ping Pong Ball Shirt.